From The Asian Reporter, V29, #03 (February 4, 2019), page 15. 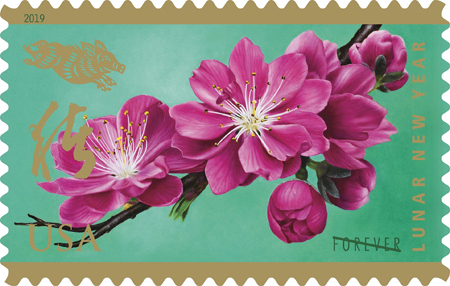 Bright pink peach blossoms highlight the 2019 Year of the Boar stamp, the 12th and final stamp in the Celebrating Lunar New Year series. The U.S. Postal Service (USPS) dedicated the stamps in January during a first-day-of-issue ceremony at the Chinese Community Center in Houston, Texas. The Boar, also referred to as the Pig, is one of 12 zodiac animal signs associated with the lunar calendar. The 2019 Year of the Boar begins February 5 and ends January 24, 2020. The Lunar New Year is the most important holiday of the year for many Asian communities. In the United States and elsewhere, the occasion is celebrated in various ways on New Year’s day and in the days that follow. Parties, special events, and parades featuring enormous and vibrantly painted papier-mâché dragons are common festivities. The Lunar New Year is observed by people of Chinese, Korean, Vietnamese, Tibetan, Mongolian, and other heritages. Around the world, millions of people welcome a new year with gifts, music, and celebration. Individuals born during the Year of the Boar are said to be generous, compassionate, and warm-hearted. Diligent and focused, these individuals often have a great sense of responsibility and finish what they start. Peach blossoms, like those depicted in the stamp art, are of particular significance during this time of year. In China, peach trees typically bloom in early February, just in time for the new year, with the striking pink blossoms marking the beginning of spring. Introduced in 2008, the Celebrating Lunar New Year series is the second to honor the Lunar New Year. The first series ran from 1992 to 2007. Combining original artwork by Kam Mak with two elements from the previous series of Lunar New Year stamps — Clarence Lee’s intricate cut-paper design of a boar and the Chinese character for "boar" drawn in grass-style calligraphy by Lau Bun — art director Ethel Kessler created a culturally rich stamp design that celebrates the diversity of America. The Year of the Boar is being issued as a souvenir sheet of 12 self-adhesive Forever stamps. 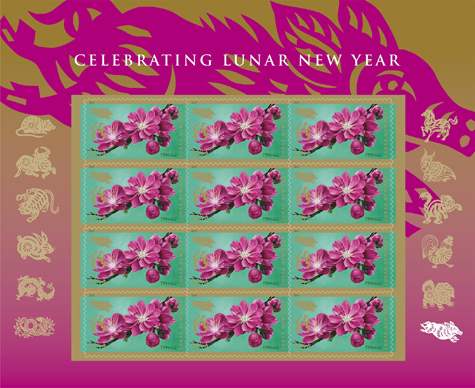 To learn more, or to purchase the new Lunar New Year stamp, call 1-800-STAMP24 (1-800-782-6724) or visit <www.usps.com/stamps>.